Conservation spending is usually justified by claimed avoidance of building new generating capacity - but increased differences between average and peak use make the "capacity value" proposition difficult to believe. Maybe it's easier to reduce unnecessary consumption (ie. phantom usage) than it is to eliminate the heating and cooling needs that drive demand peaks - and conservation programs should then be valued at "off-peak" market pricing (withour capacity value). Across the U.S., but most pronounced in New England, the ratio of annual peak-hour electric demand to average hourly demand has been rising over the last 20 years. In New England, the peak-to-average demand ratio has increased from 1.52 in 1993 to 1.78 in 2012 (see footnote for trend methodology). In other words, the highest peak-hour electric demand for the year in 1993 was 52% above the hourly average level while in 2012 peak-hour demand had risen to 78% above the hourly average level. This translates into decreasing average utilization levels for generators in New England and other regions. Electric systems maintain sufficient capacity to meet expected peak loads plus a reserve margin. As the peak-to-average ratio rises, generators called on to meet peak-hour demand are running fewer hours and/or at lower output levels the rest of the year. Since energy payments are generator's primary source of revenue in Regional Transmission Organization (RTO) systems such as ISO New England, this trend in hourly demand is likely cutting into generator profits and increasing the importance of capacity market payments to generators. The entire article, at the U.S. Energy Information Administration website, includes graphs for 8 otehr markets. I'll add Ontario. 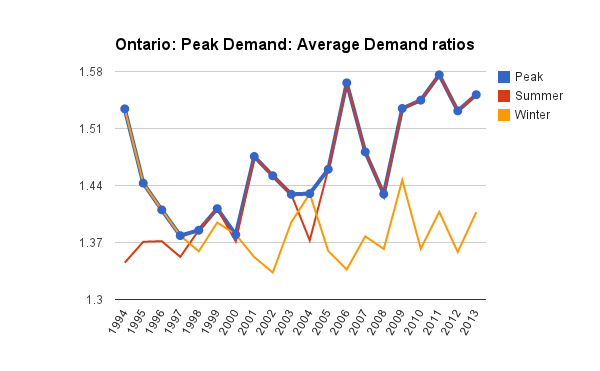 - and include both summer and winter peaks (as ratios of the annual average demand). One should be able to see the results on Ontario's emphasis on consevation - considering the spending that's been done. The dataset for 1994-2002 is not exactly comparable to the data post-May 2002, and December 2001 is totally bluffed, but it gives a good representation of Ontario's trend. I've started digging into this 300-page report, and my first impression is that a lot of vested interests won't be very happy with it. As for me, Id'say it's a mix of good, bad and ugly, but more importantly, a clear rejection of the previous government energy policy. The environmentalists have many things to like in this report, but even them will cringe at some of the recommendations (including the support for the inversion of the Enbridge 9B pipeline and suspending the WCI cap-and-trade with California until other jurisdictions join in), the forestry industry will love the new focus on biomass for heat, but will hate the call for the cancellation the biomass generation program; consumer groups will like the cancellation of wind farm projects and a more powerful Régie de l'énergie but will be livid if the government goes ahead with a hefty gas tax to reduce consumption as suggested in another section; the North Shore will probably be happy with the call to expand the gas pipeline to the area but frown upon the suggestion that HQ drops the large industrial loads post-2041, and so on.